Lawyers have a bad reputation in this country. And while hiring a lawyer can certainly be expensive, it doesn't mean they aren't a worthwhile investment. To be sure, most legal professionals get into the business to see that justice is done and people get the representation they need. If you have been putting off calling a lawyer for any of the following situations, rethink your actions. A good lawyer is well worth the money. Divorce is extremely common these days. Research shows that in the United States alone, one divorce occurs every 13 seconds. Even more sobering, an estimated 80 percent of couples are headed toward divorce within the first four to five years of marriage. If your marriage fails, you will hopefully be able to come to terms amicably using a mediator. But if that's not the case, and you are both butting heads over the separation of property, custody, and money issues, you need to lawyer up as soon as possible. For most of us, a lawsuit is something we see in movies and on TV, and that's about as close as we want to get. For the unlucky few, a lawsuit can bring the whole world crumbling down. Lawsuits can be frivolous, like patent trolls or blatant cases of opportunism, but sometimes they can be frighteningly serious. 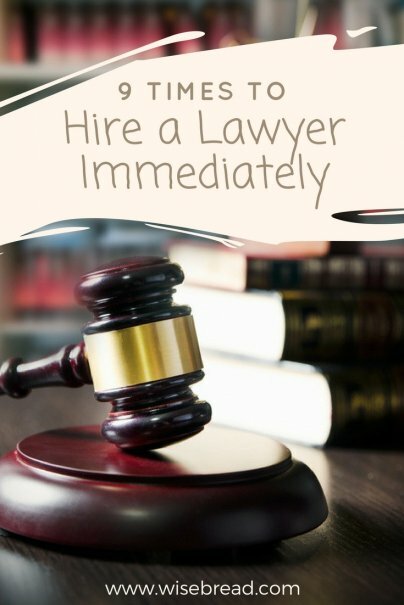 If you find yourself being sued, don't hesitate to call several lawyers and find the one best suited to your specific case. Many offer a free 30-minute consultation. Whether you're injured, or someone else is (including a driver or pedestrian), you should get yourself a lawyer as soon as possible. For the most part, insurance companies want to get this all wrapped up quickly and efficiently, and that will mean a lowball settlement that could leave you seriously out of pocket due to medical expenses. This covers the gamut. You may have been let go due to a misunderstanding, or some kind of corporate political maneuver. Perhaps you were wrongly accused of theft, harassment, or any other kind of "termination with cause." You may have been laid off and are left hanging without the severance package you feel you are owed. Whatever the reason, if you feel you were unfairly dismissed, get yourself a lawyer and fight the decision. In most cases, you'll be much better off fighting this with an expert than on your own. If you're just incorporating yourself for an Etsy store or some freelance writing, you'll probably do fine using an online service like LegalZoom. However, if you're entering into a partnership, have plans for rapid expansion, or see potential issues with copyrights and patents, you need to get a lawyer on board as soon as possible. There are lawyers out there that specialize in this kind of legal representation, and they know the business world inside-out. Spending a little money upfront can save you a fortune later on, especially if you hit a massive roadblock with a competitor or have a falling out with a partner.